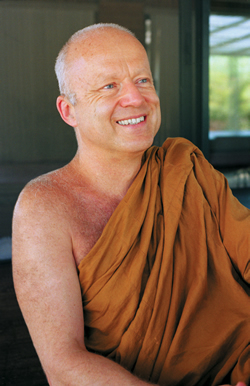 In Theravada, the relationship between teacher and student is like that between a master craftsman and his apprentice. The Dharma is a skill, like carpentry, archery, or cooking. The duty of the teacher is to pass on the skill not only by word and example, but also by creating situations to foster the ingenuity and powers of observance the student will need in order to become skillful. The duty of the student is to choose a reliable master, someone whose skills are solid and whose intentions can be trusted, and to be as observant as possible. After all, there’s no way you can become a skilled craftsman by passively watching the master or by merely obeying his words. You can’t abdicate responsibility for your own actions. You have to pay attention both to your actions and to their results, at the same time using your ingenuity and discernment to correct mistakes and overcome obstacles as they arise. This requires that you combine respect for your teacher with respect for the principle of cause and effect as it plays out in your own thoughts, words, and deeds.